If your home or business has carpeting, upholstery or area rugs, you know how dingy the carpeting can become over time. This is especially true if you have a large family or deal with significant foot traffic throughout the day. Sure, you can vacuum a few times a week, but it's not doing much when it comes to getting deep down into the carpeting where stains, dirt and odors can hide. There is no reason to throw away that gorgeous area rug or replace the carpeting throughout your home or office because our company offers high-quality carpet cleaning for your needs. The reason carpet cleaning as well as upholstery cleaning is necessary is because it does several things, all to the benefit of your home, office and family. For one, professional cleaning gets rid of deep set-in stains, allowing your carpets and rugs to look good as new. If you're planning to sell or rent out a home, carpet cleaning is an absolute must as it helps to improve the overall aesthetic appeal of the property. Also, cleaning your carpets and upholstery regularly will get rid of deep odors that you might not have even noticed. If you have an odor to your home or in a particular room and don't know where it's coming from, chances are that it's the carpet, upholstery or rug. When you hire our carpet cleaning North Bay experts, we will come to your home or place of business and provide our services. We will clean the carpeting, area rugs and upholstery in an efficient and thorough manner. This means that when we leave, you're fully satisfied with the work. We offer free estimates if you're on a tight budget and simply want to get an idea of what it will cost you to get whole-house or room-by-room cleaning done. Your satisfaction is 100 percent guaranteed and we don't leave happy until you're happy with the finished result. 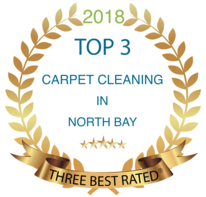 We at Carpet Cleaning North Bay offer routine care and maintenance to those who want to keep their home's carpeting and upholstery looking its best. 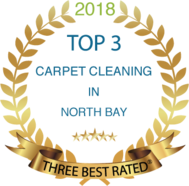 We recommend that you have your carpets thoroughly cleaned by our professionals several times a year, according to the size of your family and the amount of pets and children that you have. Instead of renting a machine and dragging yourself around to do your own cleaning, hiring our services is much easier and more efficient, and it can be a lot more affordable than you ever thought possible. Be sure to contact us today to set up an appointment to have the cleaning done at a time that is convenient for you. Our company has years of experience cleaning carpets, upholstery and area rugs. We are able to provide this service to all types of homeowners and business owners, no matter the size of your property or the type of carpeting or area rugs that you want us to clean. We can just as easily and thoroughly clean that expensive antique area rug as we can the basic carpeting that you've had installed by a hardware company. No size is too small or too big for our team, and we look forward to serving you, your family and your clients if you're a business owner. Because we are able to work with your schedule, it's convenient to have the work done since we work with a time and date that is best for you. We offer a five percent (5%) discount on your initial order with our company. This allows you to try our company for a discounted rate. This discount applies to new customers only and the coupon must be shown at the time of booking your cleaning. We are happy to provide our superior cleaning services even for those using discounted promos and coupons. We want you to make us your go-to company for all upholstery and carpet maintenance and this is why we provide our services at affordable and effortless rates. If you've noticed your carpeting looking dingy, worn or having an odor to it, it's time to contact our team so that we can get started on restoring it to where it is as good as new. There is no reason to throw out that area rug, couch or replace the carpets in your entire house, as a good-quality cleaning is often what's needed for proper restoration, odor removal and stain removal. Be sure to contact our office so that we can schedule a booking for our team to begin work. If you would like a free estimate, you can contact us or fill out our estimate form. We look forward to working with you and are sure that you'll be satisfied with the job being done.